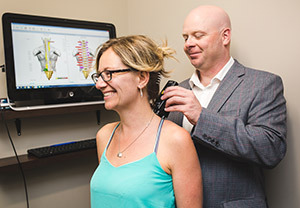 Dr. Pawlovich performing a computerized thermal and muscle scan as part of a new patient examination. Dr. Pawlovich may recommend Sole Supports custom-made foot orthotics to assist with stabilizing the feet, ankles, knees, pelvis and spine. Simply give the office a call at (306) 244-7080 to book an appointment for an assessment. Many insurance benefit plans cover the costs of prescribed, custom-fit, foot orthotics. They can be fit, ordered and constructed within 7 days. Check out this app called StraightenUp Canada- The only free app designed by Canadian Chiropractors. Simple exercises that can be performed daily to prevent spinal issues and gain strength. Check it out!